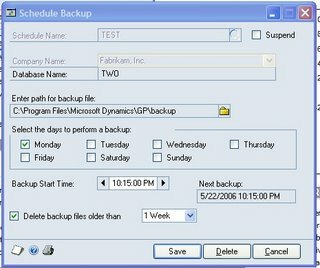 Dynamics GP 9 and up allows you to schedule backups from within the application. You'll need to be logged in to GP as an administrator and you'll need to be on the server. Go to File-Backup. Enter the system password if you've set one. The backup window opens, pick Schedule.